I was chatting via E-Mail with Jay Karen of PAII, and he was curious to see if anyone was having any success using the Google Local Business Coupons? 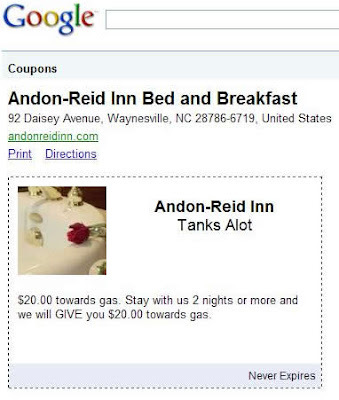 Rachel at Andon Reid Inn posted the following GLB coupon about 18 months ago. You can post your own GLB coupons, and also reference them from other sites if you like. 2 – Click on Local Business Center Icon under Products. Note: If you don’t have a Local Business Center Icon, Click here to learn how to claim your listing. Once claimed you will automatically have a Local Business Icon listed under Products. 3 – At the top of the Page Click the large BLUE Coupons tab. 5 – Fill out the requested information and Save your Coupon. 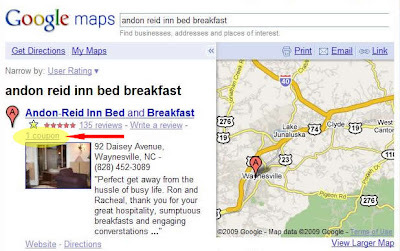 Once the Coupon is saved, you will see it show up in Google Maps as indicated below in the YELLOW Circle. If you are using GLB Coupons, and are willing to share your results, please Post a Comment below to share your thoughts!